I have one of those classic programmers working for me. He doesn’t want to try anything new unless he figures it out first on his own. So I’ve been trying to get him to look at the ADF during the beta, but he just wouldn’t bite. He, rightly so, wanted to make sure our existing applications worked with the new 9.2 back end. 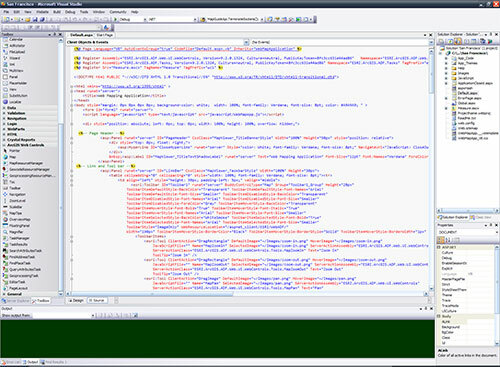 Well yesterday he caught me creating a website in the new online manager and opening it up right in Visual Studio 2005. I could see him getting very interested and he couldn’t believe that it worked like that. Create a website using a wizard and then open it up in Visual Studio? That seemed impossible to him. Well he gave it a shot on his own and was as amazed as I was when Art Haddad showed it to me. Visual Studio integration so important to my developers that they are chomping at the bit to get developing. Of course we still haven’t received out production licenses of ArcIMS so they might have to wait to deploy until those show up and hope our existing apps are grandfathered so we don’t have to pay extra ADF licensing.